Following the weekend (12/27-12/28) storm, abundant soft snow (up to 12 inches) was available for wind transport. Cold easterly winds started Sunday afternoon and continued through Monday to transport snow to westerly aspects. In northwest Montana, west aspects are typically scoured by the normal west-southwest winds. 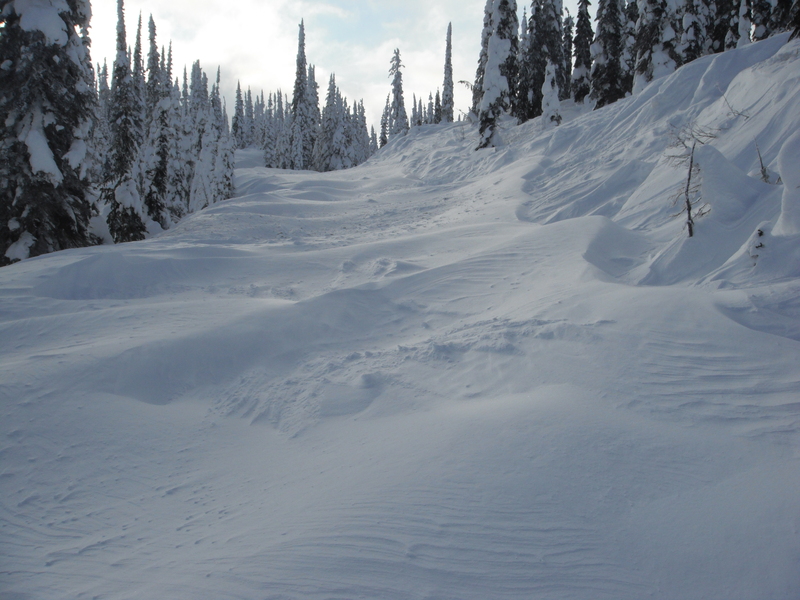 Backcounrty travelers need to recognize this dramatic change in conditions and avoid wind loaded west slopes. 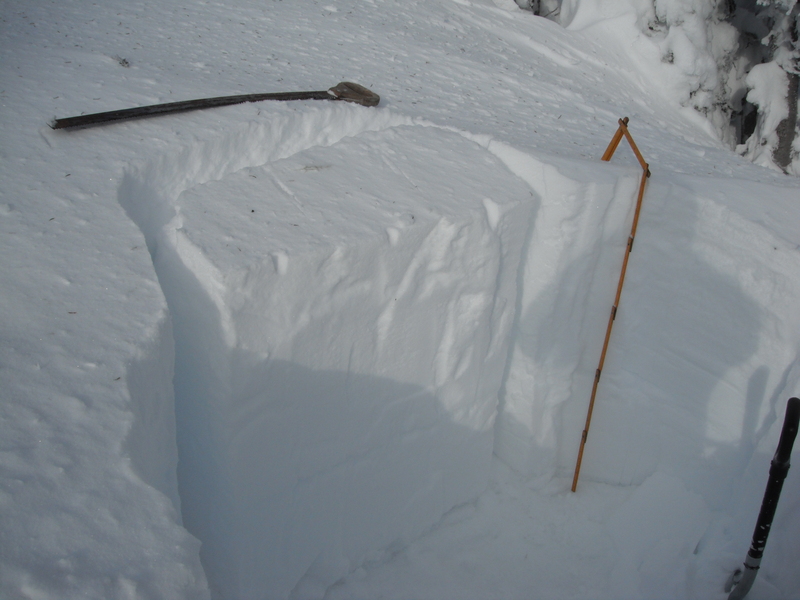 Our northwest Montana snowpack is dominated by base layers (rain crusts) topped with weak layers (buried surface hoar) that provide excellent bed surfaces for snow above to collapse and slide on. When digging your hasty pits, be on the lookout for these very soft and fragile buried surface hoar layers. They are easy to identify by brushing the pit wall with your gloved hand. When found, be conservative in your decision making and cautious in terrain selection. 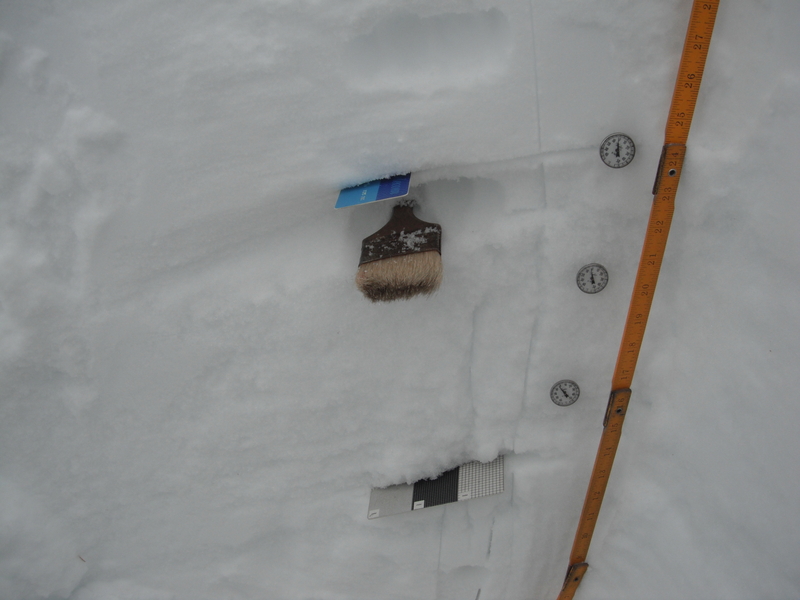 Buried surface hoar between blue card and brush. The past week has really been the "start of winter" in far northwest Montana. With several major storms loading slopes, frigid temperatures creating and preserving weak layers, and winds transporting snow, our snowpack has become more complex. Do not be lulled into a false feeling of safety because winter was so slow in arriving. 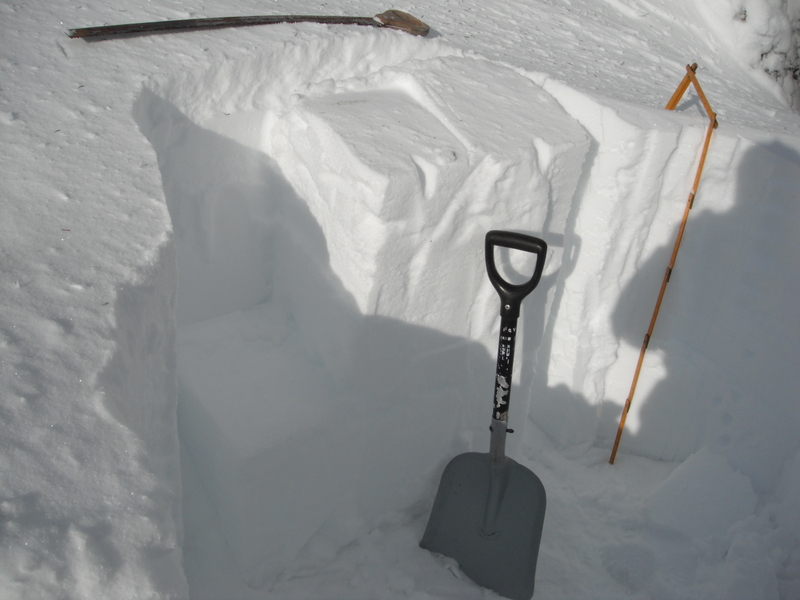 We have rapidly covered slope anchors, developed excellent base layers for snow to slide on, and weak layers to collapse or fail under an additional load (YOU!). 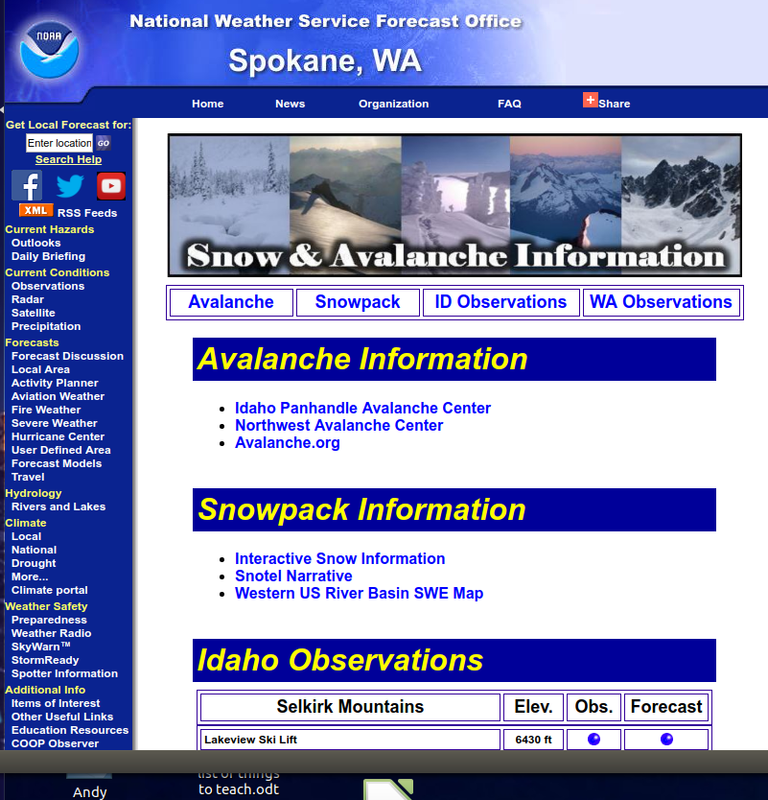 Weather, snowpack and terrain are sending you all sorts of messages on which to base your decisions. When in the backcountry, do not turn off the computer (YOUR MIND). Use its full capabilities and please be safe out there. Today I visited Bear Mountain 6061 feet in the West Cabinet Range. As I climbed in elevation enroute to a pit site, I found more and more evidence of the overnight strong easterly winds. On an east aspect protected from the easterly winds, I found 58 inches of total snow. The top 14 inches was very soft new snow from the previous weekend's storm. Below this was a 4 inch soft slab (4 finger) layer, then a 4 inch hard slab (1 finger) layer atop a 2 inch knife hard raincrust. Below this raincrust is a 14 inch very hard slab (pencil) layer that sits on the Thanksgiving rain crust. Within this column are two significant temperature gradients, one at 48-52 inches and another at 36-40 inches from the ground. Extended Cloumn Test resulted in partial propagation at about 14 inches and 18 inches from the surface with easy to moderate force. Since Wednesday, Dec 24 weather has been cool with a strong pulse of snow Saturday afternoon and Sunday morning. 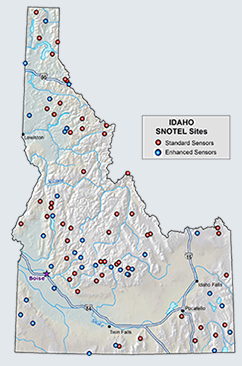 All SNOTEL sites recorded below freezing temperatures day and night. Snow water equivalent (SWE) increases ranged from 0.5 inches to 1.1 inches. Snow depths increased from 3 inches to 12 inches. After passage of the snow front Sunday temperatures have plummeted to single digits with strong easterly winds transporting a substantial amount of snow Monday morning. East wind transport looking south to Rattle Pass. Today at Bear Mountain (6061 feet), an air temperature of 6º F and east wind of 15 mph produced a wind chill of -13º F under clear skies. Forecasted weather through Wednesday is continued frigid temperatures and dry with additional snow transport Monday night with northeast winds of 14 mph.